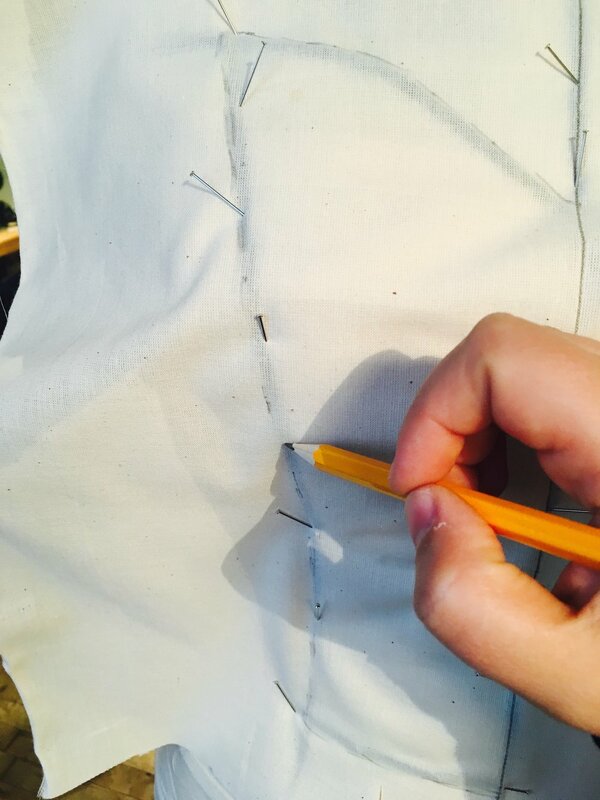 After we have come up with your design, sketched it out and in most cases we have picked the fabric I start by taking your measurements. 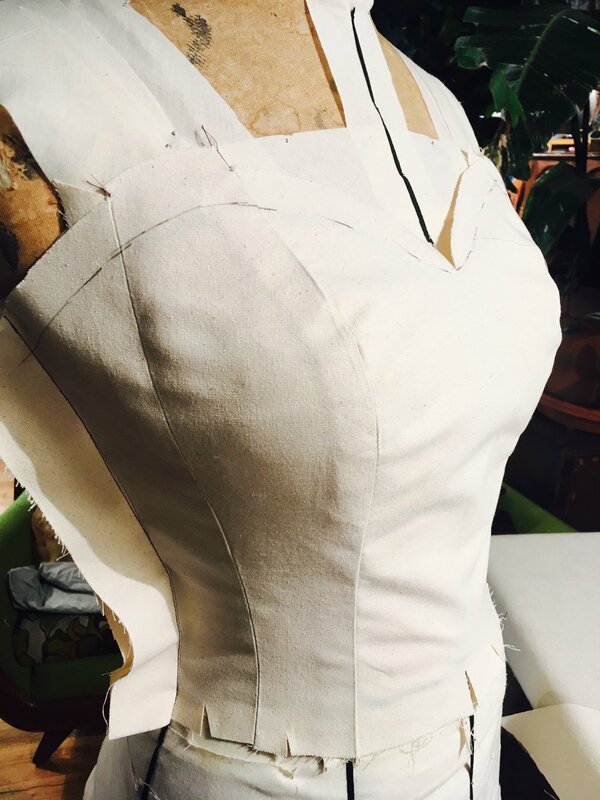 (To my brides who are from out of town I usually send in a specific list of measurements, dictated by the design, and they go to a tailor to get measured). Keep in mind that initial measurements are not final. They are used just to get an idea of your over all body type and shape. Many brides sign up for my service 8-12 months before their wedding and spend the time, leading up to the big day, dieting and working out. I take that into consideration and make adjustments along the way. 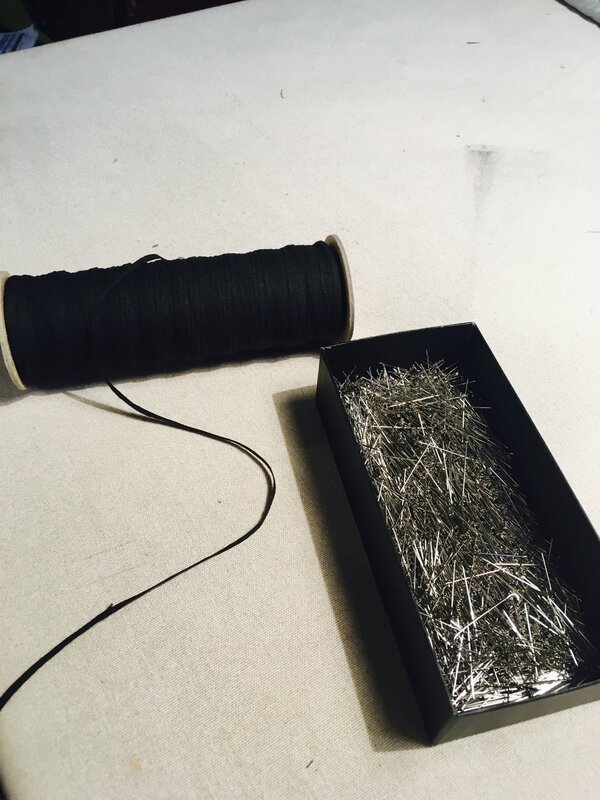 This is primarily the reason why the final fitting takes place 2 weeks before the wedding, assuring the garment is a perfect fit. 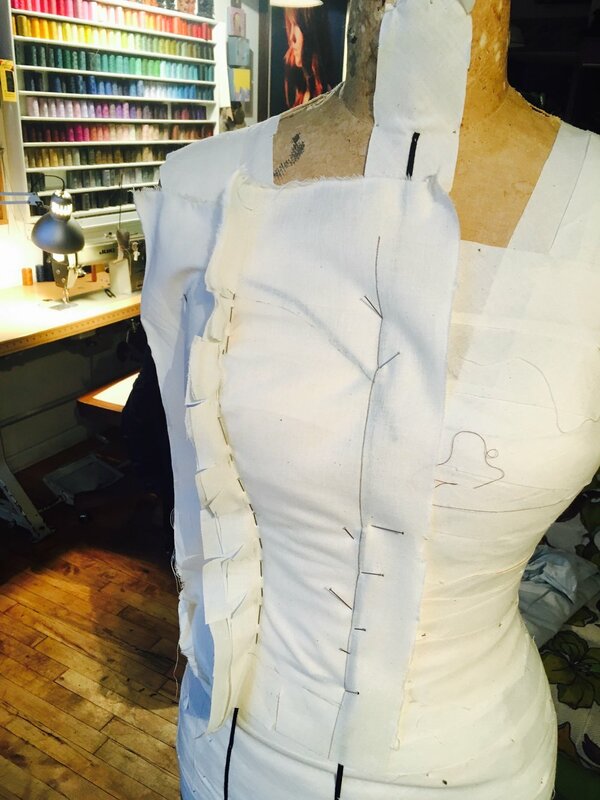 When I have all the information, I continue by building out one of my dress forms precisely to the bride’s measurements and body shape. (I went to FIT- I still to this day use what I learned from our amazing professors and instructors). 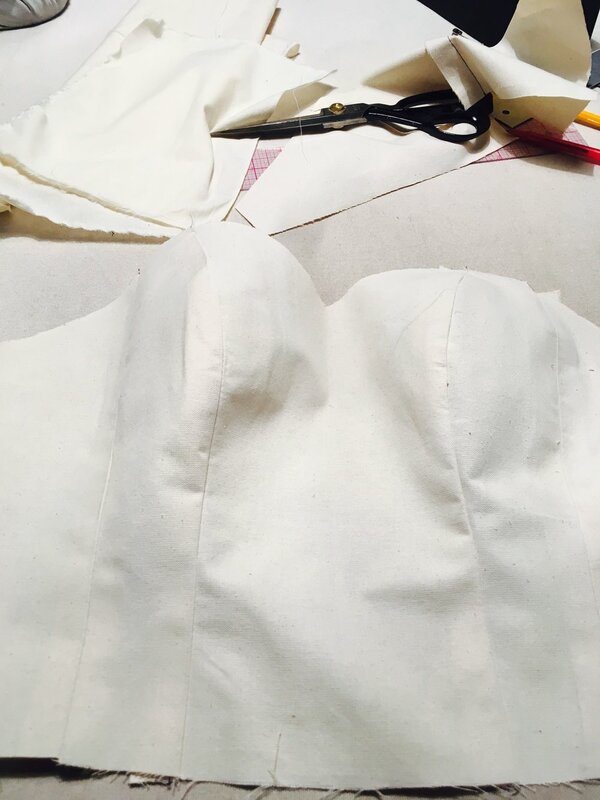 Usually I start by adding padding and then smoothing it out with bias cut tape. 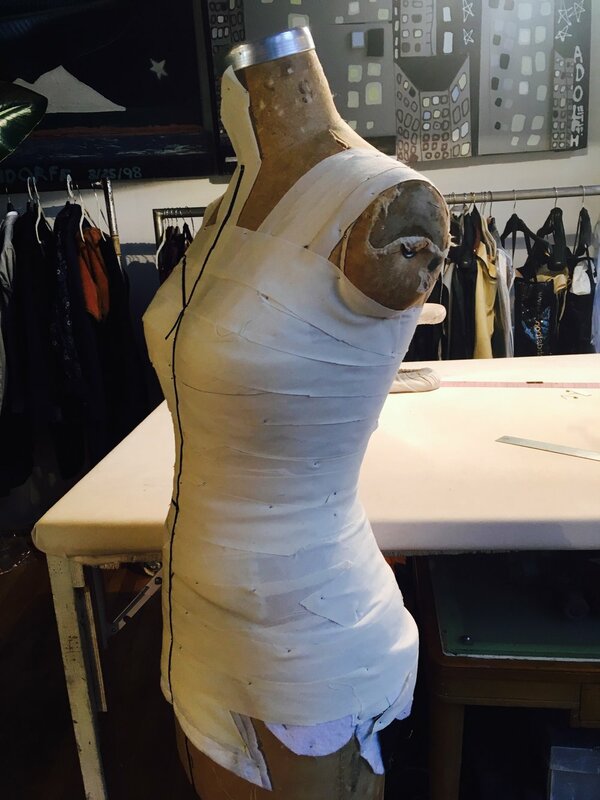 This gives me the precise base to construct the dress on. 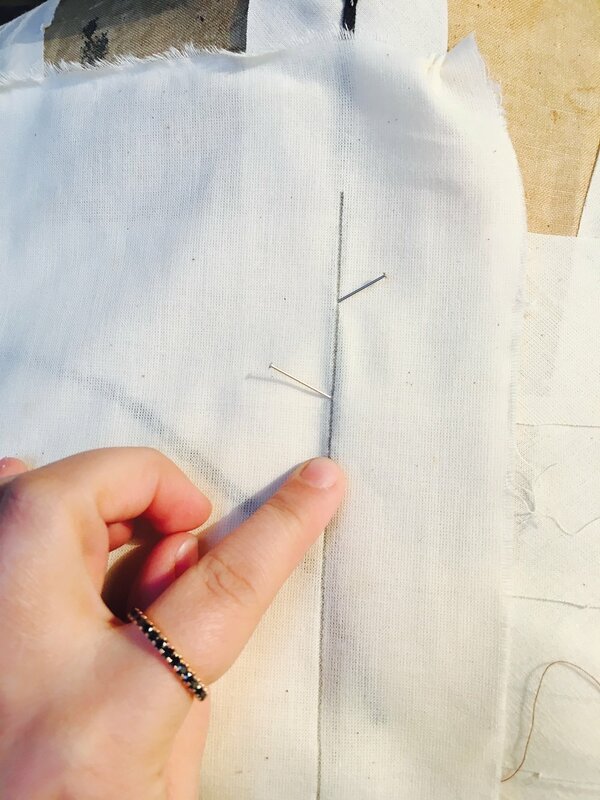 No one, I repeat NO ONE has the measurements of a standard dress-form, therefore this part of the process is exceptionally important in making a flawless custom dress. 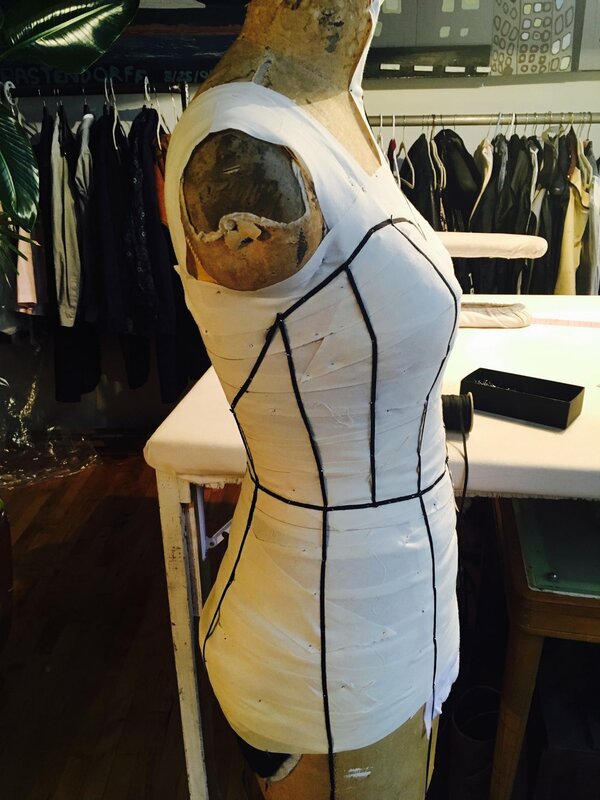 After I am done with padding my dress-form, I continue by drawing my design lines on the mannequin with black style tape. Every bride has an area of ones body that she likes and area that she doesn't, regardless of her size and shape. By making a copy of the bride’s body I can really work out the proportions of the design with this in mind. 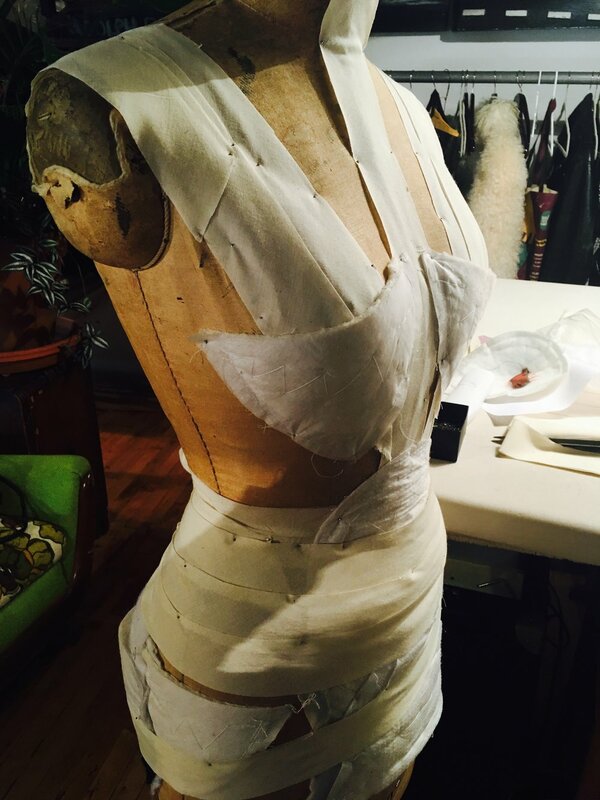 When all my design lines are in place I drape the garment, usually in muslin that has weight and feel similar to the real fabric that we are going to use. For example, if the real dress will be made in a light sheer, I would drape this part in lightweight chiffon and I would use a heavier fabric for the corseted parts. In many cases the dress has a corset as the foundation for the bodice. 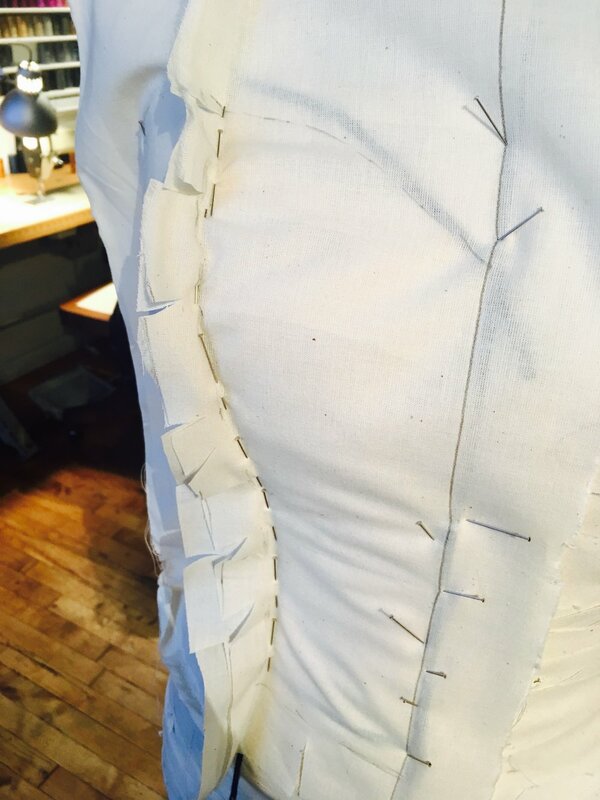 The function of the corset is to provide support for the bust and achieve the desired shape of the waist. 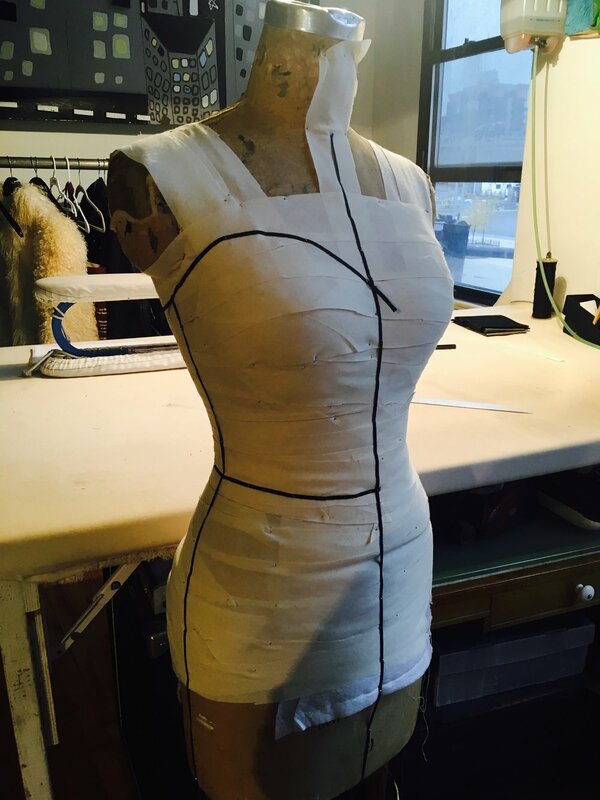 The fact that my dress-form is now shaped and padded gives me the opportunity to squeeze and tuck in certain areas, as if it is a real person, and to achieve perfect shape. 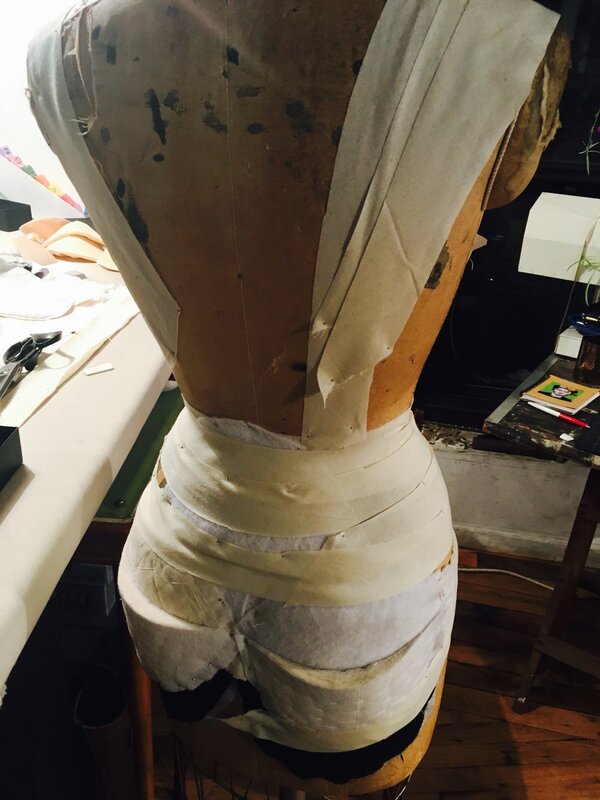 After I am done with the foundation, I am ready for the first fitting and the real fun can start! 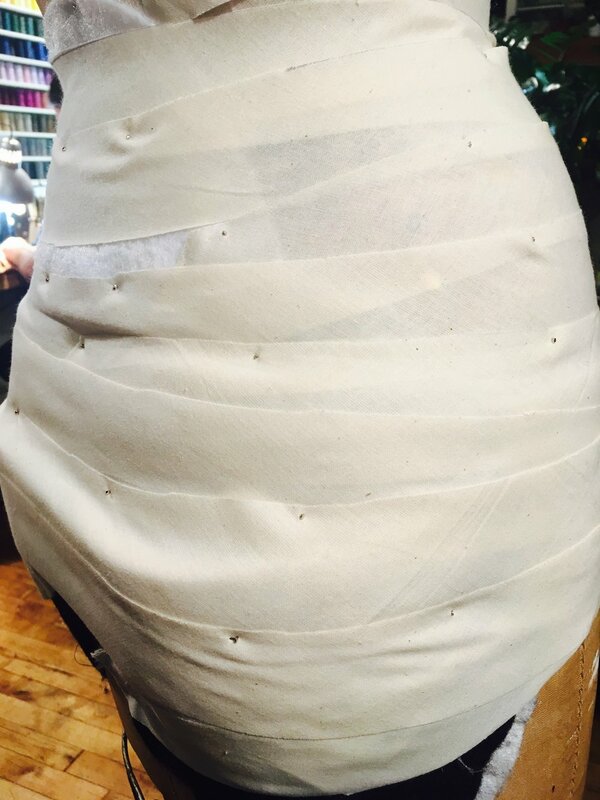 The bride now can see what the dress will look like on her and we can begin playing around with lace placement or draping of pleats, or whatever else the design requires.